I did an Archive search for "Portable Power" and "Generators" and found no results. Normally I do not do outdoor Events if it involves the small portable Generators and collapsible EZ Up Tents without sidewalls. I would refer them to someone and take a 15% Referral Fee. I have a July 4th Event that I have been asked to do and it involves those two criteria. I am meeting with the person in charge tomorrow and will then decide whether or not I will take this Gig. For those who regularly use Generators what have you all been using? More than likely I will rent one. I am NOT going to buy one. This is the kind I usually use at large outdoor events in Houston and is usually supplied by the Client. (Not necessarily this one). Also there are other vendors sometimes hooked up to it as well. The Equipment I plan on using is (See Photo) plus 2 Bose 802s and 4 JBL 15" Scoops (Each at 16ohms but run in parallel as stereo pair to get 8ohms per side. What do you recommend and what should be my concerns. There will be no lighting. Thanks! Adding up the nameplate amp and equipment specs will probably result in overspecifying the generator. Get yourself one of those $20 plug in green power meters, play some similar material, and find out how much electrical power you rig needs. Normally I use about 4 amps but that is when I am doing Karaoke using a single JBL MRX518 Sub at nominal volume. A $20 amp meter will only provide accurate measurements with linear loads. If any of the equipment being measured is of the switchmode type and is not power factor corrected, a more expensive true rms meter is required to get an accurate measurement. The Honda Inverter generators come in various sizes: 2000, 3000, and 6500/7000. If the generator is going to provide power to other vendors as well, you might need to parallel two of the EU6500s. 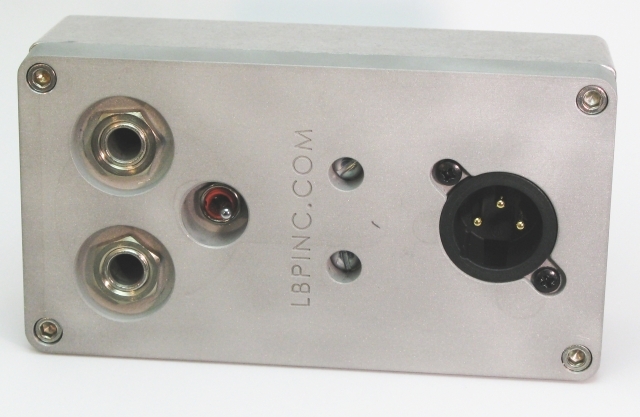 A paralleling box will combine the 240V output of two EU6500s for 100A output (50 Amps on two legs that are 180 degrees out of phase.) But, you will need to use a small 240-to-120V step-down transformer to convert the 240V output of the paralleling box to 120V. Use this link for more details on how to parallel Honda EU7000s and even the older EU6500:http://www.screenlightandgrip.com/html/emailnewsletter_generators.html#anchorParallelingEU6500s. Let's do a few engineering calculations which can be used for any small sound system. Note that this DOES NOT include lighting power, which is a different animal. While a casual assumption might be that you need a generator capable of supplying 4,700 watts or 39 amperes at 120 volts (plus an inefficiency rating for the amplifiers) in real world audio situations that's simply not the case. The general rule of thumb with modern switching amplifiers is to add up all the AC power draws of the amplifier, then divide that number by a factor of 8 to get circuit breaker capacity. I'm going to suggest a division factor that will take in account music crest factors as well as amplifier inefficiency and general disto losses. So let's error on the side of caution and make this a 1/4 load factor. If we simply divide all amplifier output power by our proposed 1/4 wattage factor, plus rounding up the power requirements since this is a real WAG, I believe that a generator will need to supply at least 1,200 watts / 10 amperes for this particular amp/speaker system. That suggests a Honda EU2000 generator should power this system with pretty thumpy, bass oriented, DJ music. To be safe I would spec a single EU3000iS generator for this gig and feel comfortable that it's not going to trip. So would any of you sound guys running Honda EU3000iS generators confirm my logic? I'm pretty confident that getting a Honda generator capable of supplying at least 1/4 of the total amplifier power with a few WAG round-ups is an easy way to size a portable generator for outside festivals. Just tell the lighting guys they need to do their own calculations and bring their own genny. Earlier today I did a Site Survey. It turns out that the Events/Vendors will be outdoors in a big Parking Lot. About 100 yards away is the back of an outdoor Bleachers/Stadium Stands and on the backside there is a Room facing the Parking lot. Apparently they are accustomed to having a DJ with only two speakers out in the middle of the parking lot. They won't have the power to project from the back of the Stadium to cover the parking lot. I assured her that is they can supply me AC power from that room and if I can setup just inside the room that they would have music to cover the desired area. If not they will supply me with at least a 5,000 watt generator. This was the Agreement. My Agent will get a contract for this arrangement. Thanks lads for everything. Now thanks to you all I have a bit of an idea what to request for Portable Power. I would make sure my contract stated that any generator will be of the inverter type and not a construction generator. I think even a honda eu2000i would power this rig pretty well. I can power 2 qsc k12, 2 qsc k10, an ls9, 2 keyboard amps, a keyboard, and a kw181 off of mine when needed. I want to thank everyone for the suggestions. I did do the Gig this past Saturday and was allowed to setup inside the Electrical room at the back of the Stadium facing the Parking Lot. In there were several dedicated 20Amp AC Circuits. I used one, Speakers were outside facing where the Vendors and Games were located and everything turned out well. Once again Thanks!